Mustang Exhaust Tip (Left Side) for 2005-2009 Mustangs. This tip is made from polished stainless steel, meaning that it will look great out of the box and maintain its appearance over the long-term with its corrosion and stain resistance. This tip is a replacement part for ROUSH exhaust systems that work with the ROUSH Rear Fascia for 2005-2009 Mustangs (#401271). 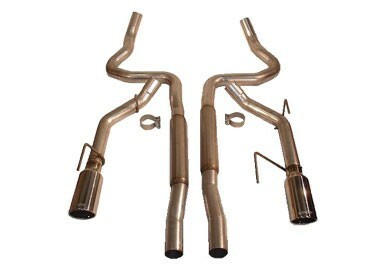 This part comes as part of the ROUSH 2005-2009 Mustang exhaust systems featuring tips: legal system part #401338 and off-road system part #401339. This tip is also included in 2005-2009 ROUSH Mustangs with the ROUSH Rear Fascia. The matching right tip is sold under part #403548.